As one of the few Adventurers with Overdrive Punisher, Aoi is a great pick despite her low rarity. Great offensive skills with AoE damage compliment her high damage output. The Blade weapon type is among the best for punishing Overdrive, with its Force Strike ranking third. It’s also decent for fragile DPS thanks to the long range; Aoi can stand far back and still hit broadly. A cheerful and devoted ninja from another land. Such joy is unusual for one in her line of work, but she also carries deep emotional wounds. Per her master's last request, she's come to the castle in search of a new person to serve. 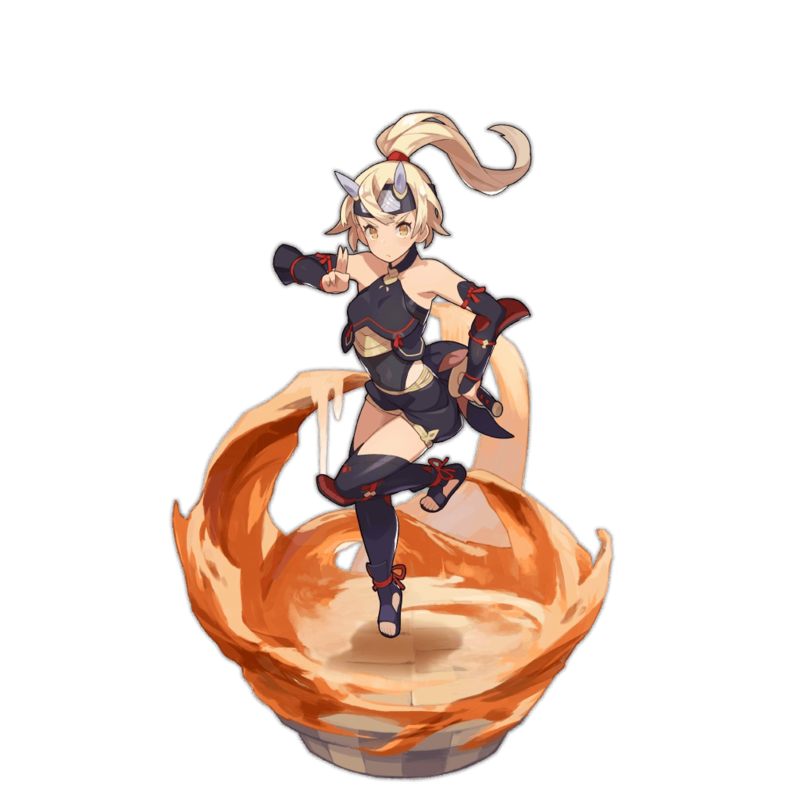 Aoi comes as a natural 3★ attuned to the Flame element and wielding a Blade. 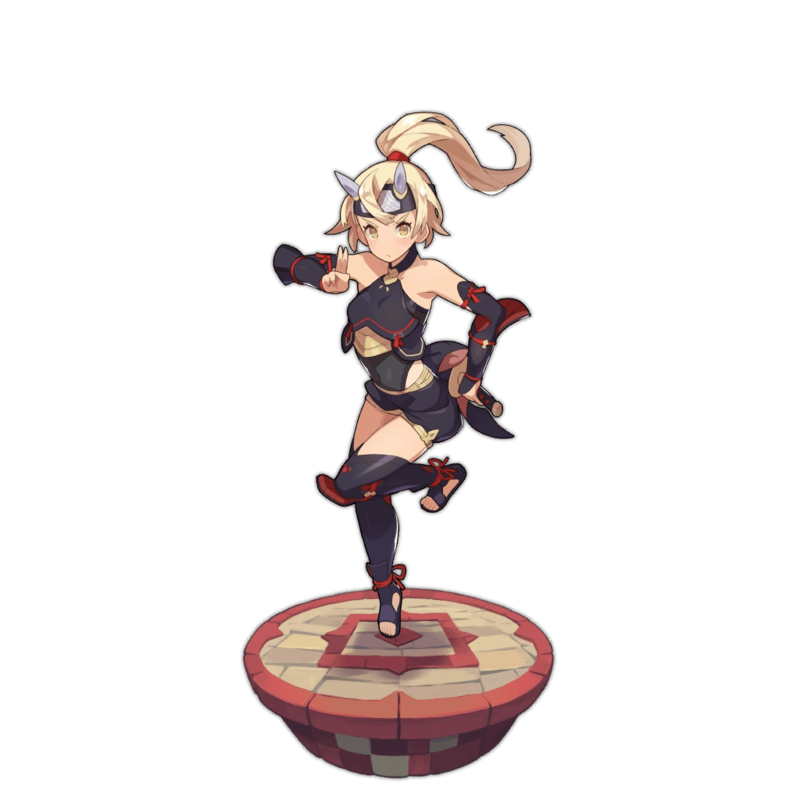 She’s notable for her great weapon type and Skills, which have low SP costs and strong damage modifiers. As far as damage dealers go, Aoi is straightforward, yet effective. Aoi is best suited to Imperial Onslaught and Void Zephyr due to her Sleep resistance. Aoi’s job is to deal damage, and she’s very good at it. 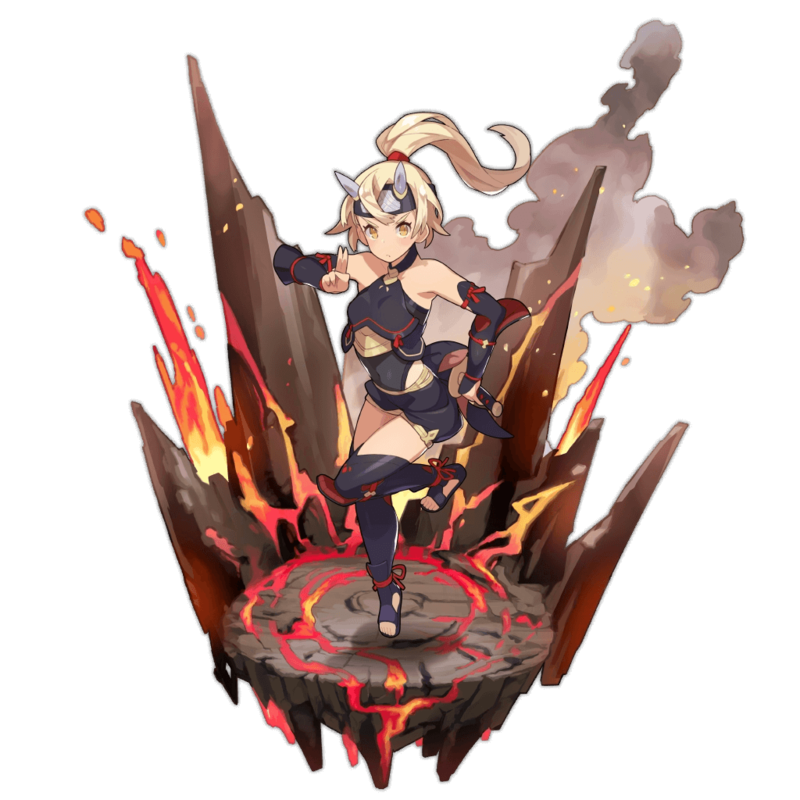 Her base 468 Attack is one of the highest among 3★ Adventurers and even competes with higher rarities. Something that sets Aoi apart from her peers are her two offensive Skills. Searing Chakram is particularly good, requiring only 2630 SP and hitting for 878% damage in a large radius. Both of Aoi’s skill have very short execution times, making them easy to weave them between boss attacks. Blades have a long forward range, good damage, and a decent SP charge rate. Adept Aoi players can weave Focus Strikes into their combos to deal more damage, build SP faster, and improve her Overdrive Punisher uptime. Aoi’s primary weakness is her lack of survivability. She has one of the lowest base HP values at 666 and no abilities to mitigate damage. Although her fast-charging skills give her many changes to dodge, taking one or two strong hits will leave her at critical health. Aoi requires skillful dodging to get the most out of her strong kit. Aoi brings nothing to a fight beside her co-ability and damage, meaning she lacks synergy with other adventurers and requires support from others to be at her best. Agni/Cerberus Thanks to their 40-60% Strength boosts, the 5★ gatcha dragons are the natural choice for all damage-dealing Flame attackers. Prometheus isn't going to boost damage as much as the other two, but his Wind Res will be appreciated by any melee Adventurer. Heaven's Acuity: This is the ultimate weapon for Aoi, with a great Ability and a monster stat increase. While Aoi is far from a top-tier pick for High Dragons, lacking the appropriate resistance and having abysmal HP, this is the weapon of choice for that challenge. Blazing Steel: Those planning on using Aoi in Void Zephyr should craft Blazing Steel, as it provides Dull Res. Skyrender: The Flame Void 5★ blade is an excellent budget alternative to Heaven’s Acuity. While Aoi is nowhere near meta for High Midgardsormr, the Skill Prep and stat boost offered by Skyrender is still appreciated in IO or Event challenges. Aoi's kit is heavily focused around Skill Damage and will want to accenuate that with equipment. Heralds of Hinomoto is one of the premier skill damage prints. Resounding Rendition is another other top skill damage print. Plunder Pals/Hitting the Books are good budget choices for those who lack the more powerful prints. Samurai Siesta is the go to print for people looking to boost Aoi's Sleep resistance to 100%. Good 4★ prints for Aoi include Fresh Perspective, Together We Stand, and the ever popular for raids King's Countenance. Increases damage to enemies in overdrive state by 5%.